A few years ago, my mom chose to wear organic clothing instead of mainstream apparel. After she made this choice, my mom no longer suffered from migraine headaches or allergy symptoms such as sinus infections. She also discovered that she was making an eco-friendly decision when she decided to dress in organic apparel. My mom became healthier and happier, since her choice of attire positively impacted her health and the environment! If you would also like to wear this people and planet—friendly organic clothing, we are here to help! Natural and synthetic fabrics are the two materials used in the production of mainstream clothing. Natural Fabric is derived from nature since it is made from plant and animal fibers. 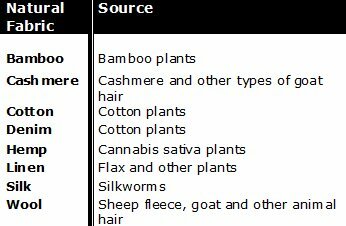 See the table below for examples of natural fabrics and their origins. Unlike natural fabric, synthetic fabric is human-made. Synthetic fabric is derived from petrochemicals by chemical engineers in the petrochemical industry. Petrochemicals are synthetic chemicals that engineers make from the hydrocarbons in petroleum and natural gas. First, engineers use hydrocarbons to produce petroleum and natural gas products at refineries. Then, at petrochemical plants, these products are chemically engineered to form synthetic fabrics such as acrylic, nylon, polyester and spandex. Can you believe that those polyester pants from the 70’s came from oil?! Your acrylic skirt is not the only product that comes from the petrochemical industry. Besides fabrics, other goods produced at petrochemical plants include plastic, rubber, detergents, drugs, dyes, fertilizers, insecticides and other products. Yikes! Another type of synthetic fabric derives from a natural source, but is categorized as synthetic since it also undergoes chemical engineering. Fabrics such acetate, modal, and rayon come from natural fibers from the cellulose in the wood pulp of trees. However, they do not become the fabrics that they are without synthetic chemical intervention. Unfortunately, synthetic fabrics are used to make many mainstream clothes. The synthetic fabrics in our commercial clothing harm people and the planet since their production involves the using up of natural resources and the utilization of harmful petrochemicals. The manufacture of many synthetic fabrics used to make our clothing requires a hefty amount of non-renewable natural resources such as petroleum and coal. The production of these fabrics also necessitates large quantities of other natural resources like water. This use of precious reserves depletes the environment of the natural resources that we depend on. The need for oil in the production of synthetic fabrics also keeps us reliant on foreign oil. The petrochemical manufacture of synthetic fabrics involves the use of toxic hydrocarbons and other chemicals that contaminate our planet. Exposure to these harmful organic compounds may detrimentally impact the workers that produce the fabrics and the consumers that wear them. Petrochemicals are comprised of many potentially toxic hydrocarbon molecules. The formation of many fabrics involves the chemical manipulation of primary petrochemical hydrocarbons into petrochemical intermediates and other more complex, sometimes poisonous chemicals. Benzene and formaldehyde are also a couple of examples of the VOCs (volatile organic compounds) used in the manufacture of petrochemical fabrics. When VOCs evaporate at room temperature, they give off vapor emissions that people can inhale. Inhaling these VOC fumes can not only cause cancer, but also a range of health problems from liver damage to skin irritation and headaches. Along with the VOC formaldehyde, carbon monoxide is also used in the processing of polyester fabric. Formaldehyde and carbon monoxide are two of the many toxic chemicals that industrial fabric plants pump out into the environment on a regular basis. The carcinogenic chemicals and VOCs I mentioned are only a handful of the many dangerous chemicals in the fabrics that manufacturers make and consumers wear every day. Even synthetic fabrics that derive from natural sources are unsafe. For example, rayon comes from the cellulose in the wood pulp of trees. However, rayon does not become a fabric until it is chemically processed. The transformation of the wood pulp involves toxic substances such as carbon disulfide and hydrogen sulfide. Exposure to carbon disulfide and hydrogen sulfide can cause death or a variety of health ailments that involve damage to the digestive, respiratory and neurological systems. So Synthetic Fabrics are Harmful…Are the Natural Fabrics in Your Clothing Safer? Unlike synthetic fabrics, natural fabrics are not human-made petrochemical products. However, the natural fibers in your mainstream clothing still become exposed to harmful and potentially carcinogenic petrochemical products since they are conventionally grown on the farm. Toxic pesticides, insecticides, herbicides and fertilizers are used in the cultivation of natural fibers like cotton. Conventional farmers also drench natural fibers that come from animal sources such as sheep with harmful chemicals. Petrochemical products like insecticides are applied to the sheep fleece in order to ward off parasites. The petrochemicals that are used on both plant— and animal derived natural fibers end up on more than just the fabric in our clothes. They also pollute our water, soil and air. Petrochemicals also endanger the farmers that work with them and the people that wear clothing made from natural fabric. Before that shirt you picked off the rack became a clothing product, it went through a lot. Fibers become fabrics that become clothing goods. This journey requires both natural and synthetic fabrics to undergo extensive chemical processing and finishing treatments that endanger your health and pollute the environment. Washing, shaping, and bleaching the fabric. Involves the use of dangerous chemicals such as polyvinyl alcohol, chlorine and VOCs like formaldehyde. Dyeing, printing and designing the fabric. Involves the addition of harmful VOCs like benzene. Azo dyes used on clothing may cause allergic reactions and skin conditions like dermatitis. Plastic designs may involve the use of phthalates which may be carcinogenic and may impair sexual development. PBDEs. (Polybrominated diphenylethers) are often used on fire-retardant fabrics. According to the Environmental Protection Agency, these flame retardant chemicals may impair the neurological system, liver and thyroid. Even flammable fabric which does not contain PBDEs may be comprised of other chemicals that emit toxic fumes when set ablaze. PFCs. (Perfluorinated chemicals) including the carcinogenic PFOS (perfluorooctane sulfonic acid) and PFOA (perfluorooctanoic acid) which may show up in stain, wrinkle and water-resistant fabrics. Formaldehyde. May be used to process permanent-press clothing, and these fabrics may emit toxic VOC fumes as a result. ...But is there an alternative? Yes! Organic clothing! Why Choose Organic Clothing Instead of Commercial Attire? When my mom learned that most of her mainstream clothing was made with natural and synthetic fabrics, she was scared. All she could think about was all the hazardous chemicals that went into the production and processing of her attire. This worry inspired her to discover a safe alternative: organic clothing—made from organic fabric that is produced and processed with regard for your health and the environment. Organic fabrics are made from natural fibers that come from plants such as bamboo, cotton, denim, hemp and linen. Unlike the conventional production of these natural fibers, organic fibers are grown without the use of toxic and potentially carcinogenic herbicides, insecticides, pesticides, and fertilizers. This means that the organic cotton fabric in your t-shirt was not produced with chemicals that endanger your health or pollute the environment. Organic fabrics also are made from natural fibers that come from animal sources such as goats, sheep and silkworms. These animals produce organic fibers since they have been raised organically instead of conventionally. This means that conventional chemicals like insecticides are not used on sheep fleece or other animal fibers. Therefore, the fabric in your organic wool sweater is not produced with chemicals that harm you and the planet. The term “organic” applied to other animal-derived fibers has other positive meanings. For example, the conventional production of silk involves killing the silkworm while it is still in its cocoon. In contrast, the organic production of silk does not harm the silkworms. Instead, the silk fibers are obtained from the cocoon after the silkworm emerges from it as a moth. Since organic fabrics come from nature, they do not derive from the toxic petrochemicals that produce synthetic fabrics. Better yet, unlike both mainstream natural and synthetic fabrics, organic fabrics undergo little or no dangerous chemical processing, are colored and printed with vegetable dyes and inks instead of with toxic ingredients and are not finished with dangerous chemical treatments such as stain proofing. So organic clothing arrives on the store aisles free of the chemical saturation found in commercial apparel. Organic clothing is a safe alternative that protects you and the environment from the toxic ways that mainstream apparel is produced and processed. I bet you are not surprised that my mom’s headaches and allergy symptoms went away once she started to wear organic clothing instead of commercial apparel! If, like my mom, you choose organic clothes instead of mainstream attire, you are also decreasing the demand for the dangerous petrochemical-based products that harm people and the earth. Organic Clothing seems like Such a Perfect Alternative…is there a Catch? Now that you know the many benefits of organic clothing, I’m sure you’re wondering what the “catch” is. In the past, the “catch” for my mom was that organic clothing was more expensive than conventionally made attire. However, today organic products are becoming increasingly inexpensive as mainstream outlets have begun to vend them on a wide scale. Many big corporations such as Wal-Mart, Gap, Patagonia and Nike are using organic cotton in their products. Jean companies like Levi’s and Del Forte offer organic denim in their clothing lines. Many businesses are also selling organic household textile products like pillowcases and mattresses. So if you shared my mom’s concern about the cost of organic clothing, I am confident that today you do not have to worry about finding attire at a price range that works for you. You may be able to find ever-increasing good deals on organic clothing, but there is still a point to consider. The National Organic Program (NOP) is a part of the USDA (United States Department of Agriculture) that sanctions clothing and other textile products as “organic.” These products are labeled with organic certification. The “100 percent organic” label means that 100 percent of the fibers of the product are organic. The “organic” label means that at least 95 percent of the fibers of the product are organic. The “made with organic content” label means that at least 70 percent of the product is composed of organic fibers. However, the organic certification of textiles only ensures that the fibers are produced organically on the farm according to the on-farm crop regulations mandated by the NOP. The fibers in organic clothing with a “certified organic” label may still have undergone processing and finishing with toxic chemicals once they have left the farm to become a manufactured fabric. Cotton Apparel. It was hard for me to think that mainstream cotton was harmless since it comes from nature. That was until I learned, according to the Sustainable Cotton Project, that conventionally grown cotton accounts for the use of 25% of the potentially dangerous fertilizers and pesticides in the world! So, try this organic cotton clothing instead…since it is a big deal! Bedding and PJs. Consider the amount of time you could be exposed to toxic chemicals in the mainstream fabrics of your comforter and nightclothes while you sleep. But you can be rest assured. We have found some safe alternatives for you including this organic bedding and these organic pajamas. And if you’re a pet owner, click here to discover these organic pet beds! Baby Attire and Bedding. Are you a new parent with your baby’s best interests always on your mind? The good news is that if you’re hoping to protect your child from the hazards of mainstream fabrics, we have found safe alternatives, including these organic baby clothes and this organic baby bedding. Want to find more organic clothing and textile goods on your own? Check out this advice for how to make sure that the organic apparel and other textile products you want are safe for you. Want to know more? Click here for additional environmental and people-friendly clothing options. Return from Organic Clothing to Organic Instead home page.